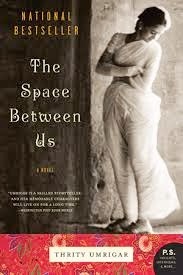 a book chick: "The Space Between Us"
my take: I've had this on a pile to read for almost a year. I'm glad to have picked it up to read in the summer ... books set in India tend toward depressing. And this is no exception. It's the tale of the space between a wealthy woman and her housekeeper ... and the space between each of them within their marriages and families. My one word description: multi-layered. That's one word-ish. Although set in India, this is essentially The Help: about the roles women play and their relationships in those roles. And a reminder of how even though the space between us is so small, it's still a chasm. And, maybe, how the reverse is true as well.